Detectives of the Los Angeles Sheriff's Department found drugs and arrested an associate of singer Justin Bieber, during a search of the pop star's home today for evidence in an egg-tossing vandalism case. Police noted that Bieber, his security and entourage co-operated fully, but did not make an official statement. The singer "has not been arrested, nor exonerated" in the felony vandalism incident, Lt. David Thompson told media at a midday press conference. ​Bieber's antics, a sign of the crushing power of fame? "I get it was done with eggs, which makes you feel it is a lower-level crime, but a felony crime is a felony crime, no matter how you commit it. It rose to the felony section and the judge signed a search warrant to go and get evidence," he said. 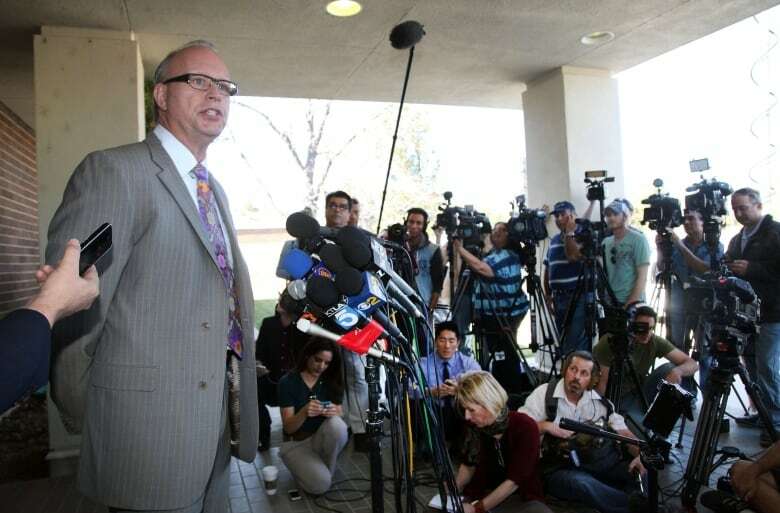 Los Angeles County Sheriff Lt. David Thompson talks to the media on Tuesday after detectives searched Justin Bieber's home looking for surveillance footage that might serve as evidence the pop star was involved in an egg-tossing vandalism case. (Nick Ut/Associated Press)​"There's an extensive level of damage. I and the sheriff take this seriously," he added. "We didn't do the search warrant to send a message. That's not what we do." Officers arrested one of the "seven or eight" people present at the singer's house for possession of drugs, which was in plain view. The man was identified as rapper Lil Za, whose real name is Xavier Smith, 20. The drug was initially said to be cocaine, but authorities later said they were conducting tests to determine its contents. Smith was released on bail at about 8:15 p.m. local time, Williams said. Stratford, Ont.-born Bieber, 19, is under investigation for allegedly hurling eggs at a neighbour's home, at approximately 7:30 p.m. local time last Thursday. Authorities said the case is being considered a felony because the damage to the neighbour's home exceeded $400 US. Thompson said the damage was in the "thousands of dollars" and encompassed "the entire front exterior of the house." The singer lives in a gated community in Calabasas, a celebrity enclave northwest of downtown Los Angeles. Questioned about the large police contingent that arrived at the singer's home today, Thompson confirmed that nearly a dozen detectives were present to enact the search warrant. "In these types of situations, we don't know what we are going to confront ... We don't know who's staying at the house or who might be under the influence of anything," he said. "It's always good to err on the side of safety." In the past year, both on tour and while at home, Bieber has been involved in a host of "bad boy" incidents, from scuffles with paparazzi in London to allegations of graffiti vandalism and claims he visited a brothel in Brazil. However, previous police investigations into his conduct have not led to charges. In October, for instance, prosecutors did not charge him after a neighbour complained he drove recklessly through the area. In November 2012, prosecutors also declined to charge the singer after a paparazzo accused him of punching and hitting him after leaving a Calabasas movie theatre. Justin Bieber's antics, a sign of the crushing power of fame?